One of the most popular characters on the Futurama animated series is a robot named Bender. Bender is a high-tech robot, Unit 22 from a series of bending robots manufactured by Mom's Friendly Robot Company. 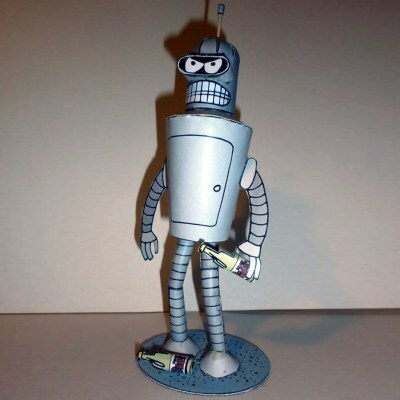 Bender's personality is much like that of an alcoholic, chain-smoking gambler. This papercraft model of Bender was created by Pedro Seidel and may be downloaded here. 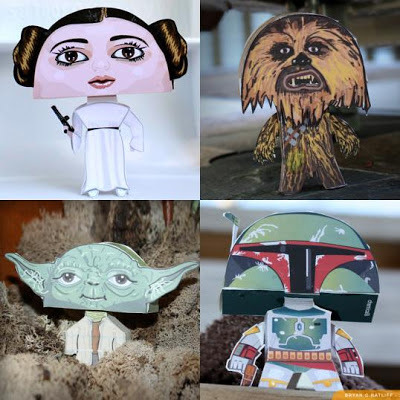 Bryan C. Ratliff has seven different Big Head Star Wars paper toys available on his Chemical 9 blog. Pictured above are the Princess Leia, Chewbacca, Yoda, and Boba Fett toys. Not pictured are two Darth Vaders and a Storm Trooper. To access the templates for the toys go to the "famous characters" section, select the toy you want, then click on the template image in the lower left hand corner. 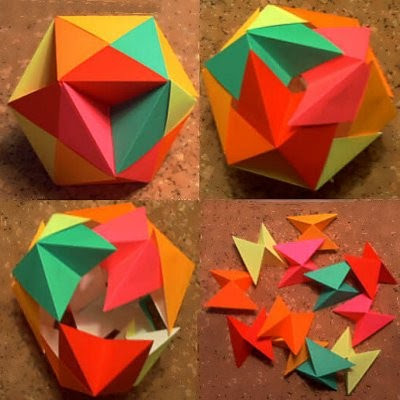 "Kenneth Kawamura's butterfly ball is a deceptive (origami) action model. Assembled from twelve water bomb bases, it forms a complex and pleasing geometric shape known as a cubohemioctahedron. The assembly is stable when resting on a surface. However toss it in the air and give it a light smack to see it explode into a cloud of butterflies which flutter prettily to earth. For this reason, it is also referred to as a butterfly bomb." Instructions for this exploding origami may be downloaded here. Also available are printable patterns to make the individual pieces of the ball look like actual butterflies. From Digiprop: "A papercraft alphabet – 26 fine templates to print out, fold and glue into letters. 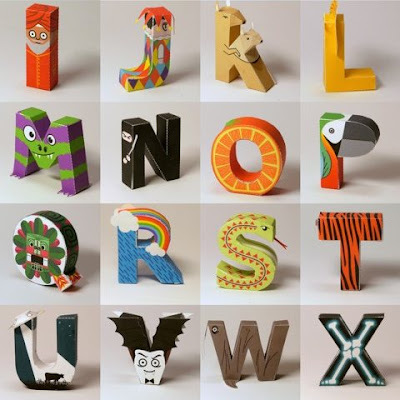 Each one represents a thing (or animal, or people) starting with that letter. In addition to being nice little toys... you can write all kinds of nice messages with them, such as ‘I love you’ or ‘Please pay the rent ASAP’…" ^^ The PDF templates for the letters may be downloaded here. This paper toy is of a Panucci's Pizza box as it appears in the animated television show Futurama. 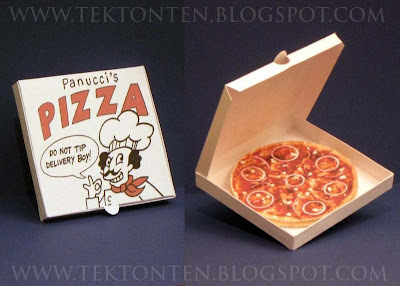 The main character of the show is Philip J. Fry, who in 1999 works as a pizza delivery boy for Panucci's. This is the fifth in my ongoing pizza paper toy series. The pizza inside this one is a barbecue chicken pizza with onions. The PDF template is available here. In the video game Legend of Zelda: Twilight Princess the hero Link makes use of a special suit of armor that allows him to breathe under water. The armor is called "Zora Armor" due to the fact that it looks like the aquatic creatures called Zoras. 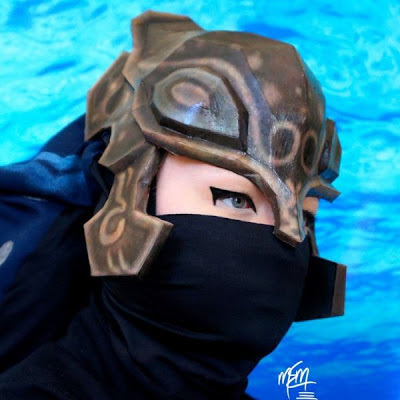 This full size papercraft Zora Armor helmet was created by Studio of MM. The template (Pepakura PDO only) may be downloaded here. 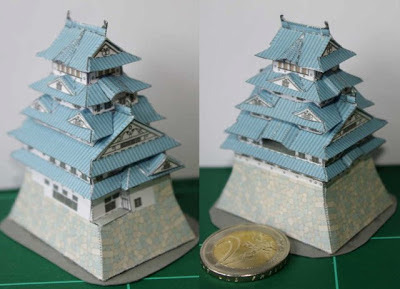 My DeviantART bud SarienSpiderDroid built this tiny paper model of the keep of Himeji Castle in Japan. 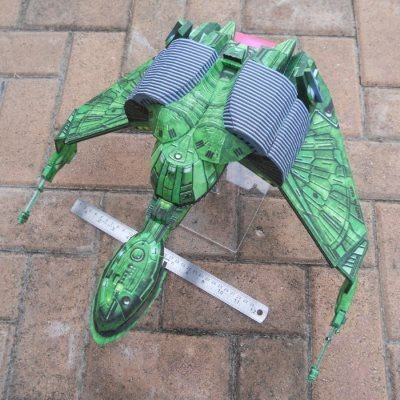 Not intended to be so small, Sarien reduced the template for the model to 25% of its original size. Himeji Castle is the largest and most visited castle in Japan. From X3d, who previously brought us a Finn and Jake diorama, here is a Marceline papercraft. 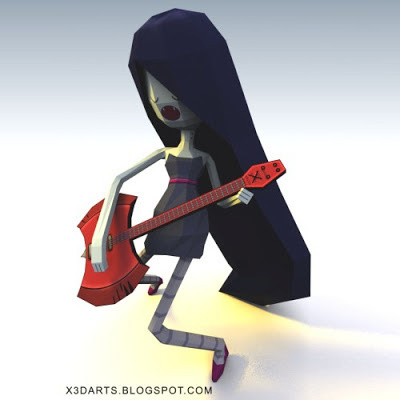 In the Adventure Time animated series Marceline is a vampire princess who is over 1,000 years old. She enjoys playing a bass guitar constructed out of a battle axe which is a family heirloom. The template for this paper model may be downloaded here.